Isoflavones, plant estrogens, are often said to be a great natural alternative to hormone replacement therapy for perimenopausal women. What do you need to know? The perimenopause is a rough time for many women — nasty symptoms like hot flashes, night sweats, fatigue, insomnia, and mood swings aren't exactly what you always wanted. Hormone replacement therapy is an effective way to counter these symptoms, but it also comes with health risks, in the form of an increased risk of things like breast cancer, heart disease, and gallbladder disease. So, what's a woman to do? For some, the answer lies in isoflavones, a more natural option that is said to allow you to avoid the potential hazards of hormone replacement therapy. Are these isoflavones — found in soy products among other things — really a "superfood" for women going through the menopause? 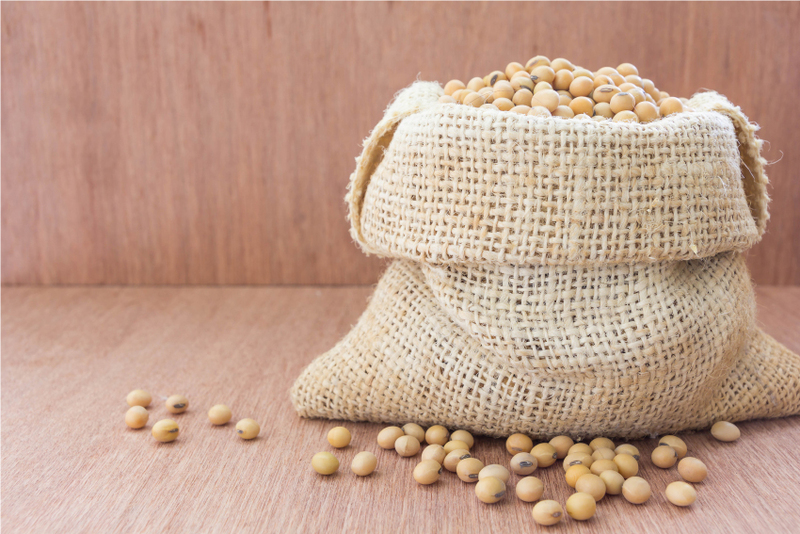 Isoflavones and phytoestrogens: What exactly are they? "Phyto" simply means "plant" — and phytochemicals are different chemical compounds found within plants. Isoflavones are also called phytoestrogens, or plant estrogens, as they are chemically similar to the human hormone estrogen. These phytoestrogens have a weak estrogen-like effect on the human body as well, which is why some women take them to find relief from menopause symptoms. Because they are a lot less potent, at about one thousandth the strength of actual estrogen, however, they're believed not to come with the same risks as taking estrogen replacement therapy. Interestingly enough, isoflavones don't just help with low estrogen levels, like you'll have when you're going through the menopause, but they also help balance your hormones out when you have high estrogen levels, as seen in certain cancers. Where can you find isoflavones? In lots of foods, actually, including pretty much any legume, but the highest concentrations can be found in soybeans. Genistein and daidzein are two different isoflavones you'll get through consuming soy products like edamame, tofu, soy milk, and miso. Should you eat isoflavones as you go through the menopause? As you approach the menopause, your hormones will take you for a rocky ride — often resulting in hot flashes, fatigue, vaginal dryness, and other nasties. While these symptoms eventually go away and some women aren't too bothered by them, your declining estrogen levels also come with long-term risks, as your risk of heart disease and osteoporosis (brittle ones) goes up after the menopause. Those women who indeed find that the symptoms of the perimenopause make their lives rather unpleasant can go to the doctor and ask for hormone replacement therapy — which is very effective at offering relief. Research has, unfortunately, found that the long-term use of hormone replacement therapy comes with some health risks, including an increased risk of breast cancer, so you may not want to consider HRT. Isoflavones sound like the perfect, more natural solution. Do they work, though? The short answer is that the jury is still out, but multiple studies do point in that direction. One study discovered, for instance, that Japanese women — who are culturally more likely to consume lots of soy-based foods — don't tend to suffer from typical perimenopausal much, and also that they have lower rates of osteoporosis once they reach the menopause. Soy isoflavones may also help you manage your cholesterol levels and blood pressure better, and other research found, reduce mood swings related to the menopause, counter fatigue, and fight hot flashes. They do not, on the other hand, seem to help with vaginal dryness or an overactive bladder. What soy products can you choose? You have plenty to choose from — whole soybeans (edamame), tempeh, soy nuts, miso, tofu, soy milk, and soy flour, among other products. Some women will find that whole soy foods cause abdominal bloating and even constipation, and for them, fermented soy products may be the better choice. Not only do some people find them more tasty, the fermentation process adds nutritional value and makes the food more easy to digest. Fermented soy products additionally have fewer phytates that can stop your body from absorbing minerals such as calcium and iron, and they're richer in vitamin K2, which promotes heart health. Miso, a fermented paste with a unique taste and texture, typically used to make miso soup. ​Natto, sticky fermented soybeans often eaten as breakfast in Japan. Tempeh, a nutty meat alternative. I want to give this a try: How? Like we said, there's not yet any conclusive evidence that consuming soy will help you fight menopause symptoms — but you can run your own mini-study on yourself to figure out if you experience any reduction in symptoms. If soy does work, it appears you need two or more servings a day to reap the benefits. Replacing some of the meat you eat with tofu or tempeh, making a miso soup, and using soy rather than cow milk, will help you get there. In addition to eating "real foods" that contain soy isoflavones, supplements are also available — but while soy foods have clear nutritional benefits, offering you things like fiber, protein, and antioxidants, not to mention a nice meal that leaves you feeling satisified, the same can't be said for pills. Real foods seem to be the way to go.